How long is the turn-around time? Can you rely on the daily availability of a board-certified professional for consultation without a phone tree? Are preliminary results available the next day? Qualifications of technologists performing laboratory set-up? Qualifications and experience of analysts? Quality and banding resolution of chromosomes? How many speciality culture conditions are available for hematopathology (e.g. myeloid, CLL, T-cell)? Are cell cultures preserved for future follow-up testing? Is metaphase FISH available for confirmation of translocations? Turn-around below 3.5 days, including weekends. Board-certified cytogenetics professional available 7 days a week. Call-back with preliminary results available the next day. Consultation available without phone tree. All technicians (wet-lab and analysis) board certified in cytogenetics. Our abnormality rate ~ 30% whereas industry average is 15-20%. Culture conditions are optimized for each hematopoietic lineage. Specialized cultures and high-resolution chromosome analysis: HematoLogics detects important abnormalities others miss! HematoLogics preserves cytogenetic cells cultures. Archived for future testing needs, including FISH, NGS, SNP/CGH microarray and molecular analysis. 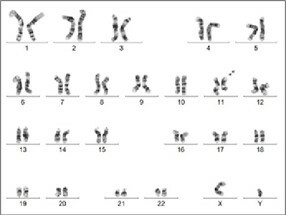 Cytogenetics is an integral part of our algorithmic diagnostic approach. Continuous technology integration during pre-analytical, analytical and post-analytical work-up (e.g. Culture conditions according to lineage, Cell sorting, Specimen archiving). Clinical History/Indications: A 68-year-old male with a clinical history of metastatic renal cell carcinoma. Concurrent flow-cytometric findings revealed an aberrant mature T lineage process involving the marrow aspirate at 32%. The current T-Cell (gamma) Gene Rearrangement PCR Analysis was positive. The current FISH study was positive for TCRB (7q34) gene rearrangements. The key finding variant inv(7) helped to establish diagnosis of a T cell neoplasm. A minimum of 2 cultures set up on every patient when possible based on white cell count. Myeloid cases: Overnight and 48-hour unstimulated cell cultures are established. B-cell Lymphoma cases: Overnight, 48 hr. and 72 hr. DSP-30/IL-2 (interleukin-2) cultures are established. DSP-30 and IL-2 are added to act as mitogen for the B- cells, which are terminally differentiated and typically don’t divide spontaneously in culture. T-cell leukemia/lymphoma cases: overnight, 48 hours and 72 hr. PHA/IL-2 cultures are established. PHA/IL-2 is added to act as a mitogen for the T-cells, again, which are terminally differentiated and don’t always divide spontaneously in culture. Myeloma cases: Overnight, 72 hr. IL-2 stimulated and 72 hr. unstimulated cell cultures (SWOG required culture) are established. It is clear from the literature that plasma cells go through the cell cycle slowly. Allowing longer time in culture and increasing the number of metaphase analyzed (30) increases the likelihood of finding an abnormal cell clone. Culture times and techniques developed to standards set by SWOG (Southwest Oncology Group) and COG (Children’s Oncology Group) for cytogenetic certification required for patients going into clinical trials. Slides are scanned by a robotic scanner and metaphase images are sent to cytogenetic technologists. Digitally produced karyograms can be imported/exported to other applications, including the use of oncology grand rounds. Automated scanning has shown a productivity increase of 35% and a decrease in technologist error via the use of this technology. A minimum of 20 metaphase cells are analyzed for all cases, when available, except for myeloma patients, who have 30 cells analyzed. All technologists have more than 10 years of experience and several have over 20 years in cytogenetics. Final review is performed by a board-certified Ph.D. level clinical cytogeneticist. Multiple images are captured for each case (50+), so there are always additional metaphase cells available for analysis without the need of additional slides. All cytogenetic fixed pellets are kept after the case is signed out and therefore available for further add-on studies (molecular genetics, FISH), if desired. An extensive FISH probe library is provided and testing uses the MetaSystems automated platform. 200 scanned images are captured and can be saved for future review unlike cells manually read. All cytogenetic and FISH results are available on Hematolinx and contain full interpretation including references and prognostic information where available. The results are integrated with other technologies that may have been used (flow cytometry, molecular genetics and morphology). The cytogenetic/FISH laboratory director is available for consultation regarding any cytogenetic or FISH case. T-cell leukemia/lymphoma cases: overnight, 48 hr. and 72 hr. PHA/IL-2 cultures are established. PHA/IL-2 is added to act as a mitogen for the T-cells, again, which are terminally differentiated and don’t always divide spontaneously in culture.